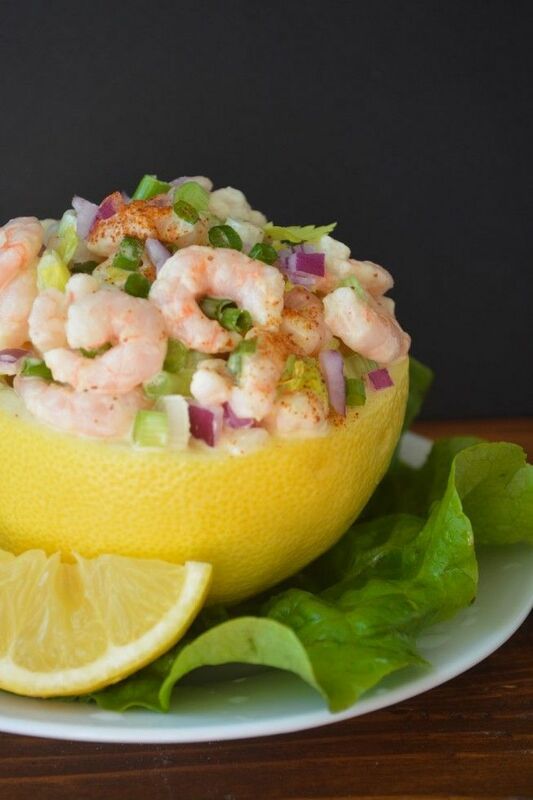 This unique Shrimp Salad with Grapefruit Mayonnaise is light and refreshing, and full of zesty flavor ~ the grapefruit mayonnaise takes just 30 seconds! Put the grapefruit juice into a small sauce pan and bring to a boil. Cook the juice for about 5 -7 minutes, until it has reduced down to about 3 tablespoons. Let cool. In a large wide mouthed jar, put the egg yolks, grapefruit and lemon juice, mustard, oil, salt, bitters and Tabasco. Add the cooled reduced juice. Insert an immersion blender into the jar, and rest it on the bottom. Turn it on, and then raise the head of the blender slowly. The contents will turn instantaneously into mayonnaise. Remove the blender and give the jar a good stir. Taste to adjust any of the seasonings. Keeps well covered in the fridge for a week. To make the shrimp salad, rinse and dry the shrimp really well. Mix all the ingredients in a bowl, and then add enough of the mayo to coat everything. Mix until thoroughly combined, and then add salt and pepper to taste. Keep chilled until ready to serve. To make grapefruit bowls, cut each grapefruit in half, and then use a small serrated knife to cut around the inner edge and remove as much of the fruit as possible. Drain any excess juice, and then fill the empty shell with the salad. Garnish with paprika, chives, and lemon wedges.